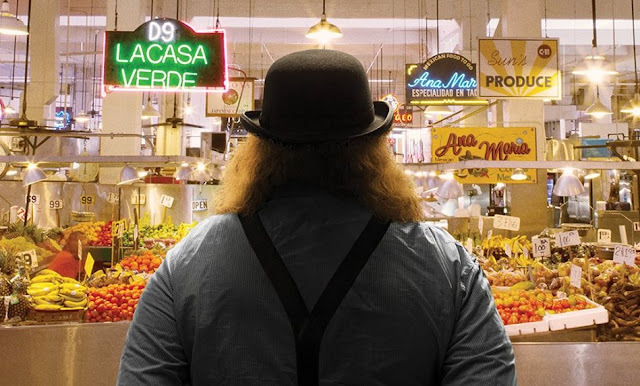 I was a little worried about seeing the Jonathan Gold documentary "City of Gold." There's something about making a whole movie about a writer that seems suspect to me, unless it's "Capote" or something equally lofty. And surely we've seen enough about the L.A. food scene by now -- us local writers are pretty jaded. We've been all over the Southland, to the taco stands in South Gate, the Thai temple and farther afield, and seen every episode of the food TV shows that have come to town, so as much as we may enjoy reading Gold's writing, it's not like we really need to go there again. But it turns out I was totally misguided in my apprehension. Director and Mt. Washington resident Laura Gabbert, who previously made "No Impact Man" as well as another look at a distinctive slice of L.A. in "Sunset Story," has woven together more aspects of the city than any half-hour TV travelogue can ever touch on. And the insider view of the city's varied cultures as seen through its restaurants is interwoven with getting to know the singular Gold himself as he drives the freeways in his pickup truck, eats with an array of local writer friends, meets with editors at the L.A. Times, tours a museum with his family and muses about his influences. Of course it's always a treat to see familiar L.A. figures like Jazz and Tui at Jitlada and Bricia Lopez at Guelaguetza, some of whom credit Gold with helping stimulate business at their restaurants. But for me, the revelation of the film was how you could immerse yourself in all 96 minutes of it and feel like you too were cruising along with Gold past endless mini-malls, along rows of tall palm trees, watching ribbons of traffic flow by during a fuchsia sunset. Gabbert is able to capture the beauty of the sometimes-ugly streets of L.A. in a way that's so cinematic that it demands to be seen on the big screen. In this regard, watching "City of Gold" is 180 degrees away from watching Anthony Bourdain's "Parts Unknown" or "No Reservations" or an Andrew Zimmern-type show. Those are all fun too, but it's a much richer and more rewarding experience to relax into the flow of the film without the frenetic editing, commercial break recaps and all the other trappings of reality shows. "City of Gold" is also valuable as a snapshot of a certain time in the L.A. food world, circa 2014 or so. Grand Central Market is starting to transform; the produce vendors are still there, but other stands are shrouded under wraps, just before Wexler's and the like are about to open. It's a time when the Guerrilla Taco truck is at the pinnacle of L.A.'s endless wave of baroque taco experiments, when Trois Mec is the red-hot target du jour of aspirational eaters. It's an eminently satisfying portrait of a person who, like all of us, is quirky and sometimes cranky but who, unlike all of us, can write the hell out of an essay about burritos or hagfish utilizing his exhaustive knowledge of anything we put in our mouths. In this way, it resembles "Bill Cunningham New York," another portrait of a fascinating artist that's also a love letter to his city and his subject matter. Gold and I both spent our childhoods eating around the Westside at places like Senor Pico and our young adult years going to UCLA and punk rock shows, so we have a certain amount in common. While his family frequented Junior's Deli, ours was more partial to Nate 'n Al (When I reveal this at a press lunch, he says, "Ooh, classy"). Near the end of the film Gold says, "I can't tell you how much I love Los Angeles." That's something else we have in common. "City of Gold" opens Friday, March 11, at the Arclight Hollywood and the Landmark in West L.A. And no, it's not on Netflix yet. Guerilla tacos are in my top 3 taco places to eat right now. Can't go wrong there. This looks like an interesting film, would definitely like to check it out.